The benefits and uses of red palm oil for hair were interesting to research because it’s not normally something I would think to put on my hair. Where I come from, we use red palm oil as the main ingredient in beans, soup, yam pottage and sweet potato pottage. It’s also a common cooking ingredient in Asia and Brazil. 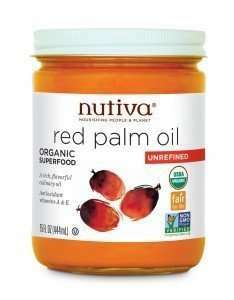 Is red palm oil good for hair? Yes, it is. Even though it’s mostly used in cooking back home, red palm oil has qualities that can help restore moisture and promote shine in dry and dull hair. In this article, we’ll cover red palm oil facts and nutrition, how red palm oil is made, how to use red palm oil on hair, benefits of red palm oil for hair, red palm oil vs coconut oil and where to buy ethically sourced red palm oil. 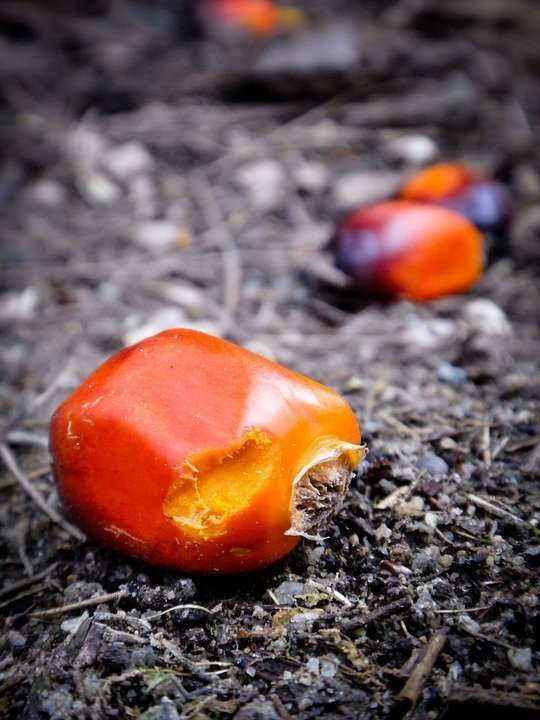 Red palm oil comes from the reddish pulp of the fruit, which grows on palm trees. 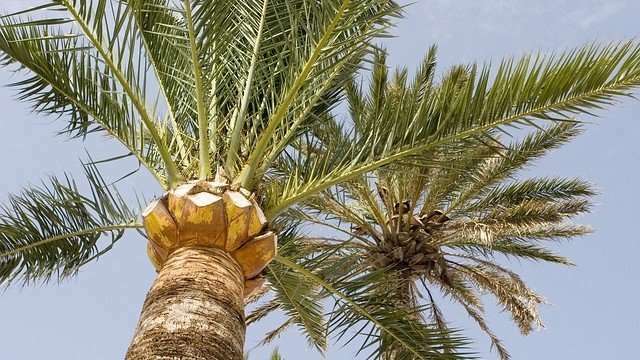 The palm tree has two species – one species is found in West Africa particularly Nigeria while the other species can be found in South America. The West African species was propagated by the Portuguese in the nineteenth century to Brazil, Indonesia, and Malaysia. Red palm oil is a rich red due to its high beta-carotene content. Another oil rich in beta-carotene is carrot Oil. How is Red Palm Oil Made? The palm fruit has a fleshy mesocarp (reddish pulp). Red palm oil is derived from this fleshy pulp. Palm oil can also be derived from the kernels, which is referred to as palm kernel oil. Both these oils are commonly confused but red palm oil has more nutritional benefits than palm kernel oil. 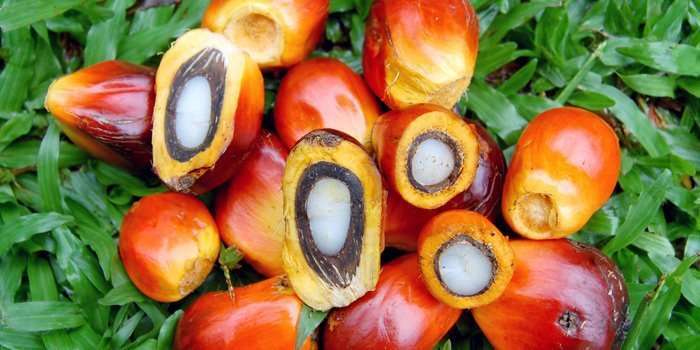 Palm kernel oil lacks beta-carotene and isn’t red in color. Processed palm oil does not contain cholesterol and acts like hydrogenated fats without having the same dangerous effects. Red palm oil contains tocotrienols – a member of the vitamin E family, carotenoids, phytosterols, squalene, and CoQ10. It is semi-solid at room temperature but can be melted by placing the bottle in a bowl of hot water. It has a high smoking point of 302° F making it suitable for high heat cooking. Dr. Oz referred to red palm oil as a miraculous find in one of his TV shows in 2013 although it’s been miraculous for quite some time in Africa. The beta-carotene contained in red palm oil is a basis of vitamin A, which is easily absorbed by the scalp. It helps keep the hair moist and balanced. Red palm oil contains tocopherols and tocotrienols (vitamin E), which lead to softer, stronger and healthier hair. 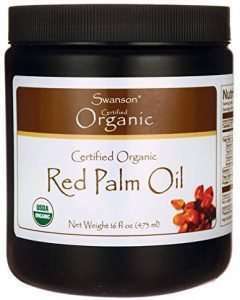 The essential fatty acids contained in red palm oil helps to add extra sheen to dry and dull looking tresses. There have been suggestions that red palm oil can help maintain your natural hair color with continuous use. Adding red palm oil to your diet promotes healthy hair growth from inside leading to stronger hair with elasticity. You can use red palm oil for frying and as the base for a sauce in your favorite foods like yams and potatoes. Read 5 Quick & Easy Healthy Recipes with Red Palm Oil for more information on cooking with red palm oil. Pour the red palm oil and coconut oil into a bowl and heat up slightly over a bigger bowl of hot water. Section your dry hair and apply the mix to each section and your scalp. 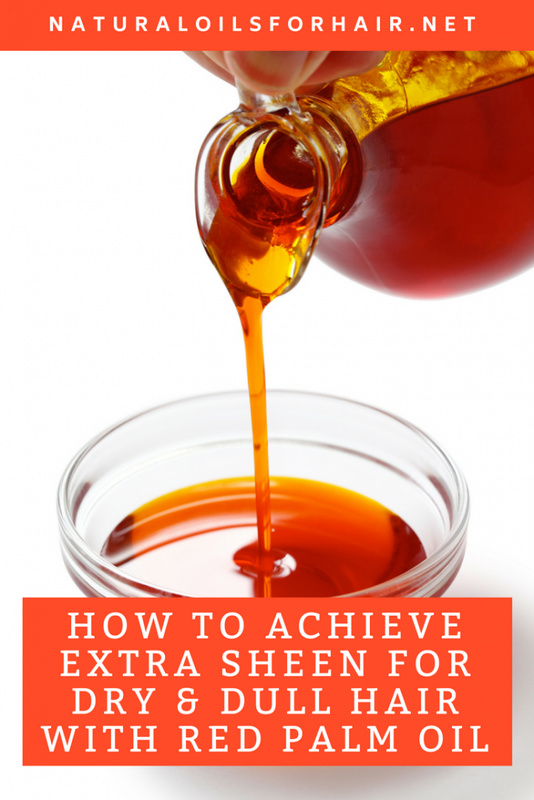 Smooth the oil mix into your hair and scalp thoroughly. Leave on for 45 minutes – 1 hour, then wash out with a mild moisturizing shampoo like Giovanni Smooth As Silk Moisturizing Shampoo, Maple Holistics Moisturizing Shampoo and Design Essentials Natural Super Moisturizing & Detangling Shampoo. Deep condition with your favorite deep conditioner. There’s a different variation of the recipe above you can try out instead. Wet your hair before applying the red palm oil and coconut oil mix then sit under a hair steamer for 30 minutes before shampooing. Mix 1 – 2 tablespoons of slightly heated red palm oil with your regular deep conditioner. You can add more if you have longer hair. Mix and add 1 tablespoon each of coconut oil and castor oil. Mix again. After shampooing, apply the mix to your hair and deep condition with heat for 30 minutes. Afterward, rinse and style as usual. If you have colored hair, this deep conditioning recipe is also beneficial and can help the color last longer. Will Red Palm Oil Stain Hair? Red palm oil can stain clothing easily and is a bit difficult to remove so wear something you don’t care about during the treatment and layer your bathroom floor with newspapers if necessary. When it comes to hair, it can help enhance your natural hair color but it will not stain hair in a negative way. Once you apply shampoo, you should be able to wash out all the red palm oil without any issues. Red palm oil helps restore shine to dry and dull hair and keeps the scalp area moist and health. This fosters an environment for healthier hair growth. However, there is no evidence that topical application of red palm oil can lead to faster hair growth. For more optimal hair growth oils plus how to combine them with your favorite oils as well as recipes, have a look at the oils for hair loss archives. The world’s largest producers of red palm oil are Malaysia and Indonesia. There are a lot of concerns about the production of red palm oil leading to deforestation and endangering the survival of orangutans, especially the Sumatran orangutan. Look for brands that produce red palm oil sustainably like Nutiva Certified Organic Red Palm Oil and Swanson Red Palm Oil. Visit our shop for free healthier hair care resources and discounts on the healthy hair care series and products. Learn more about it HERE.